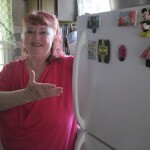 Dottie Fratturelli shows off her more energy efficient refrigerator. Thanks in part to a grant issued by the Maryland Energy Administration (MEA), Dottie Fratturelli was able to upgrade the insulation in her attic, improve the air sealing around her house, install CFLs, and replace her old refrigerator with a more energy efficient model. Not only was she grateful for the energy saving and cost-saving measures, she also appreciated something else the upgrades uncovered. During installation, significant health and safety issues were revealed and addressed. With the repair of a gas leak and the installation of carbon monoxide and smoke detectors, Fratturelli’s home is not only saving her money, it’s quite possibly saving her life, too. Ms. Fratturelli lives in Landover Hills, which is part of a collaborative partnership with other towns in Prince George’s County. The Town of Bladensburg, the lead town for the Prince George’s Municipal Weatherization Collaboration project, submitted a grant application in the fall of 2011 to participate in MEA’s EmPOWERING Clean Energy Communities Program. The group began implementing the award in February, and Ms. Fratturelli’s home was one of the first ones to be completed. Currently, more than 35 homeowners have participated in this multi-jurisdictional collaboration. The collaboration remains strong into 2013, with 90 homeowners expected to receive weatherization improvements. Read more about Ms. Fratturelli’s residential energy improvements profiled in the Gazette: Energy upgrades available for homeowners in 14 Prince George’s County municipalities.